Pablo Figueroa, Walter F. Bischof, Pierre Boulanger, and H. James Hoover. Efficient comparison of platform alternatives in interactive virtual reality applications. International Journal of Human-Computer Studies, 62(1):73--103, January 2005. (pdf) (bibtex: Figueroa-2005-ECP). Alistair Sutcliffe, Brian Gault, and Jae-Eun Shin. Presence, memory and interaction in virtual environments. International Journal of Human-Computer Studies, 62(3):307--327, March 2005. (pdf) (bibtex: Sutcliffe-2005-PMI). J. Edward Swan II, Joseph L. Gabbard, Deborah Hix, Robert S. Schulman, and Keun Pyo Kim. A Comparative Study of User Performance in a Map-Based Virtual Environment. 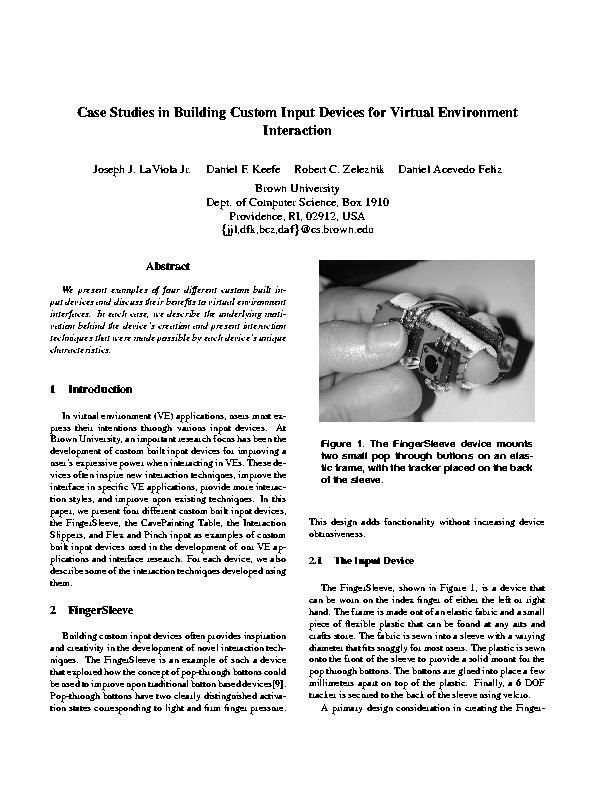 In Proceedings of IEEE Virtual Reality 2003, pages 259-266, 2003. (pdf) (bibtex: Swan-2003-ACS). Doug A. Bowman, Ameya Datey, Young Sam Ryu, Umer Farooq, and Omar Vasnaik. Empirical Comparison of Human Behavior and Performance with Different Display Devices for Virtual Environments. In Proceedings of the Human Factors and Ergonomics Society Annual Meeting, pages 2134--2138, 2002. (pdf) (bibtex: Bowman-2002-ECH). David J. Kasik, James J. Troy, Stephen R. Amorosi, Marie O. Murray, and Shankar N. Swamy. Evaluating graphics displays for complex 3D models. IEEE Comput. Graph. Appl., 22:56--64, 2002. (pdf) (bibtex: Kasik-2002-EGD). R. Kosara, S. Miksch, H. Hauser, J. Schrammel, V. Giller, and M. Tscheligi. Useful properties of semantic depth of field for better F+C visualization. In Proceedings of the Joint Eurographics—IEEE TCVG Symposium on Visualization 2002 (VisSym'02), pages 205-210, 2002. (bibtex: Kosara-2002-UPS). Nicholas J. Wade. Charles Wheatstone (1802—1875). Perception, 31:265--272, 2002. (pdf) (bibtex: Wade-2002-CWE). James S. Tittle, David D. Woods, Axel Roesler, Martin Howard, and Flip Phillips. The Role of 2D and 3D Task Performance in the Design and Use of Visual Displays. In Proceedings of the 2001 Human Factors and Ergonomics Society Meeting, 2001. (pdf) (bibtex: Tittle-2001-R23). R.W. Lindeman, J.L. Sibert, and J.K. Hahn. 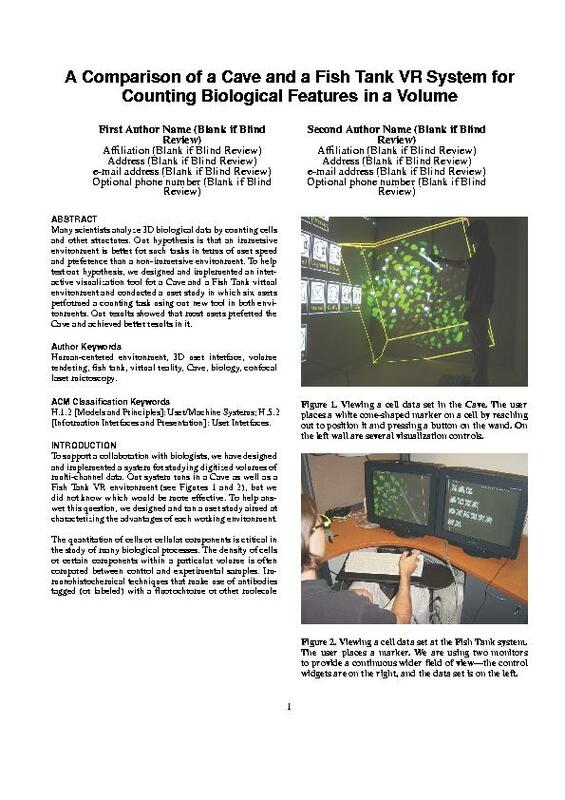 Towards Usable VR: An Empirical Study of User Interfaces for Immersive Virtual Environments. In Proceedings of CHI 99. Institute for Computer Graphics, George Washington University, Washington, DC, 1999. (pdf) (bibtex: Lindeman-1999-TUV). Martin Usoh, Kevin Arthur, Mary C. Whitton, Rui Bastos, Anthony Steed, Mel Slater, Frederick P. Brooks, and Jr. Walking > Walking-in-Place > Flying, in Virtual Environments. In Proceedings of SIGGRAPH, pages 359--364, 1999. (pdf) (bibtex: Usoh-1999-WWF). L. Cutler, B. Fr�hlich, and P. Hanrahan. Two-Handed Direct Manipulation on the Responsive Workbench. In Proceedings of the '97 Symposium on Interactive 3D Graphics, pages 107--114, 1997. (pdf) (bibtex: Cutler-1997-THD). Randy Pausch, Dennis Proffitt, and George Williams. Quantifying immersion in virtual reality. In Proceedings of the 24th annual conference on Computer graphics and interactive techniques, pages 13--18. ACM Press/Addison-Wesley Publishing Co., 1997. (pdf) (bibtex: Pausch-1997-QIV). G. Robertson, M. Czerwinski, and M. van Dantzich. Immersion in Desktop Virtual Reality. In Proceedings of UIST, pages 11--19, 1997. (pdf) (bibtex: Robertson-1997-IDV). K.W. Arthur, K.S. Booth, and C. Ware. Evaluating 3d task-performance for fish tank virtual worlds. ACM Trans. Inf. Syst., 11:239--265, 1993. (pdf) (bibtex: Arthur-1993-E3T). George G. Robertson, Stuart K. Card, and Jock D. Mackinlay. Nonimmersive virtual reality. IEEE Computer, 26(2), February 1993. (pdf) (bibtex: Robertson-1993-NVR). Colin Ware, Kevin Arthur, and Kellogg S. Booth. Fish tank virtual reality. In Proceedings of the SIGCHI Conference on Human Factors in Computing Systems, pages 37--42, 1993. (pdf) (bibtex: Ware-1993-FTV). Charles Wheatstone. Constributions to the physiology of vision---Part the second. On some remarkable, and hitherto unobserved, phenomena of binocular vision. Philosophical Transactions of the Royal Society of London, 142:1--17, 1852. (pdf) (bibtex: Wheatstone-1852-CPV). Charles Wheatstone. Contributions to the physiology of vision---Part the first. On some remarkable, and hitherto unobserved, phenomena of binocular vision. Philosophical Transactions of the Royal Society of London, pages 371--394, 1838. (pdf) (bibtex: Wheatstone-1838-CPV).